Major Robert Lawrence Thornton C.B.E. Robert Lawrence Thornton (17 September 1865 – 19 March 1947) was a barrister by profession who became the chairman of East Sussex County Council and the Provincial Grand Master for the Masonic Province of Sussex. Robert Lawrence Thornton was born on 17 September 1865 at Dulwich in south London, the third child and only son of Robert Thornton (1838–1891) and his wife Elizabeth Ann née Metcalfe (1840–1932). The Thorntons were a long-established Yorkshire family, coming from Thornton in Lonsdale in North Yorkshire. Amongst Robert’s ancestors was Richard Thornton (1776–1865), who made a vast fortune exploiting the blockade of the Baltic ports by Napoleon between 1806 and 1812. On his death in 1865, Richard left an estate valued at £2,800,000 (the largest fortune to have been valued for probate in Great Britain up to then and equivalent to in excess of £4 billion today). 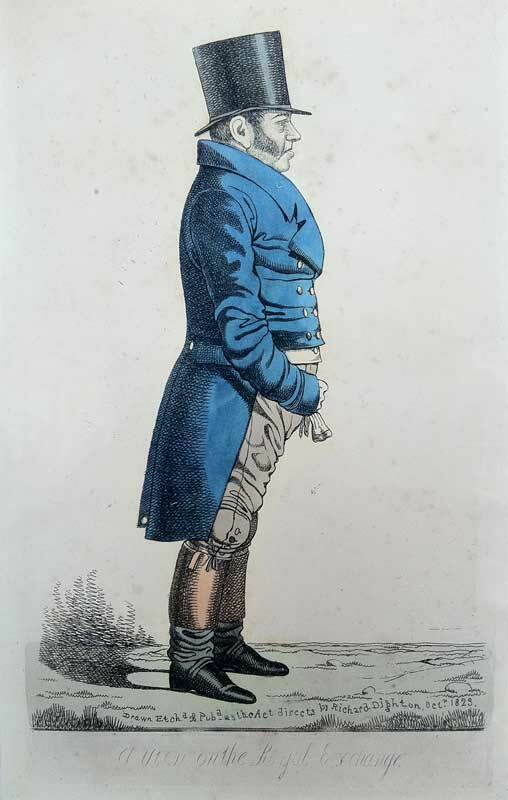 Robert Thornton senior was a merchant by profession as were his father and grandfather before him, and would become High Sheriff of Sussex in 1890 and a Deputy Lieutenant of the county, as well as becoming a magistrate. Born in Kennington on 28 January 1838, he married Elizabeth Ann Metcalfe in Lambeth on 28 October 1862. They had three daughters before Robert junior was born on 17 September 1865. Following the death of his father in 1870, Robert Thornton senior and the family moved to High Cross, near Framfield in Sussex, acquiring the former home of Sir Thomas Dyer, 9th Baronet. The family were soon heavily involved in the life of the parish church at Framfield. In 1891, the churchwardens decided to rebuild the church tower which had collapsed in 1667. To mark his appointment as High Sheriff, Robert Thornton senior offered to finance the entire cost of the rebuilding work. In December, the work was only a few feet above ground when Robert decided to examine the work in progress. Sadly, he caught a chill and died the following day, 14 December 1891, aged 53. After his father’s death, Robert Lawrence Thornton agreed to finance the completion of the tower rebuilding. On 6 October 1886, Robert Lawrence Thornton followed his father by becoming a member of the Worshipful Company of Leathersellers. Robert was educated at Cheam School, in Cheam, near Sutton in south-west London and continued his studies at Eton College. He matriculated in September 1884 and was admitted to Trinity College, Cambridge as a “pensioner”, from where he graduated as a Bachelor of Arts in 1887, gaining his M.A. four years later. He was called to the bar on 25 April 1888, and admitted to the Inner Temple on 23 January 1895, having already been appointed as a Justice of the Peace in Sussex in 1892. He was a member of the Junior Carlton Club. On 14 August 1890, at St. Mary the Less, Cambridge, Robert married Charlotte Raynes (1866–1961), the daughter of the Revd. 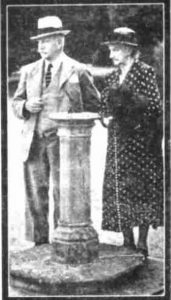 William Raynes, Fellow of Clare College, Cambridge, and Helen Garnham Luard. The marriage service was conducted by Lord Alwyne Compton, Bishop of Ely, and the Hon. Revd. Latimer Neville, master of Magdalene College, Cambridge. Helen’s brother was Admiral Sir William Garnham Luard (1820–1910), who served in the Royal Navy in the Far East, before becoming superintendent of Malta Dockyard in 1878 and then president of the Royal Naval College, Greenwich in 1882. William Rayne’s grandfather, Edward Robert Raynes was the Archdeacon of Lewes from 1815 until his death in 1823. The couple lived initially at 8 Oakhill Road, Kingston-upon-Thames but following the death of Robert’s father in December 1891, they moved into High Cross. The couple’s first child, Robert West Thornton was born at Uckfield on 28 January 1896, followed by Gerald Edward Thornton born at High Cross on 14 August 1898. At the time of the 1901 census, Robert and Charlotte and their two sons were living at High Cross, together with Robert’s mother, Elizabeth, and a retinue of nine servants. Robert described himself as a barrister-at-law and a justice of the peace. Ten years later, in March 1911, the couple were still living at High Cross with Elizabeth, and seven servants. Also staying with them was Charlotte’s second cousin, Katherine Margaret Parr née Wollaston. (Her husband, Wilfred Wharton Parr, served in the 12th Battalion, Gloucestershire Regiment, reaching the rank of captain. He was killed near Arras, aged 44, on 8 May 1917.) On the census form, Robert described himself as an “unpaid public servant” employed by “the proletariat”. In June 1933, following the death of his mother the year before, Robert made a gift to Framfield Church of a stained glass window depicting the visit of the Magi to the infant Jesus, designed by Christopher Webb of St. Albans. Robert and Charlotte celebrated their Golden Wedding anniversary quietly at High Cross on 14 August 1940. While at Trinity College, Cambridge, Robert, aged 20, was initiated into The Isaac Newton University Lodge No 859 on 27 October 1885. He was passed on 30 November and raised to the 3rd Degree on 2 February 1886. He resigned in March 1888, when he joined another Cambridge lodge, Alma Mater Lodge No 1492, where he progressed to Worshipful Master in 1891. He remained a member of Alma Mater Lodge until he resigned in February 1903. On 5 November 1892, he was the founder Worshipful Master of Loxfield Lodge No 2450 meeting at Uckfield, near to his home at High Cross. In 1942, he was re-elected as W.M. of the lodge in commemoration of its Golden Jubilee year. Having previously been a Provincial Officer in Cambridgeshire, in 1894 he obtained his first provincial office in Sussex when he was appointed Provincial Senior Grand Deacon. From 1910 to 1923, he was the Provincial Grand Master of the Mark Master Masons in the Province of Sussex. In 1912, he was promoted to Deputy Provincial Grand Master for Sussex, at the same time being made a Past Provincial Senior Grand Warden, and a Senior Grand Deacon in United Grand Lodge. On 29 Apr 1913, he was a founder of Sussex Masters Lodge No 3672, becoming the lodge’s Worshipful Master the following year. Not content with helping found two lodges, he was the Founder W.M. of Sussex Unity Lodge No 4150 in 1920. In 1926, he was appointed to the highest positions within the Province of Sussex, when he was installed as the Right Worshipful Provincial Grand Master, and Grand Superintendent, positions that he retained until his death in 1947. 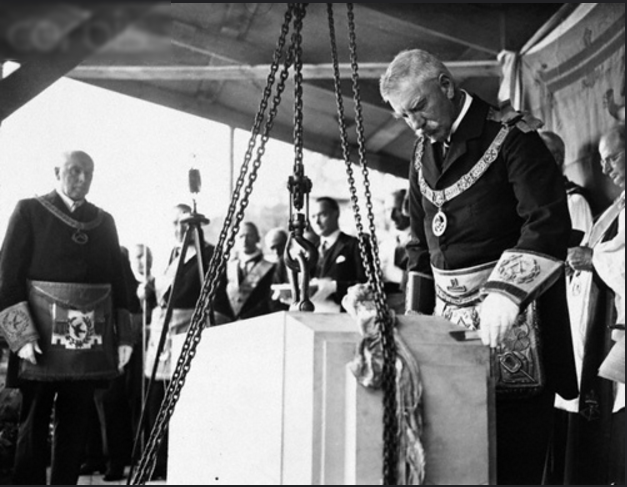 In October 1933, he was filmed for Pathé News when he laid the foundation stone of the new Sussex Eye Hospital, “with Impressive Masonic Ceremonial”. A copy of the film, with full soundtrack, has been uploaded to YouTube; see here. On 14 August 1935, Thornton Lodge No 5556 was consecrated and named in his honour. The lodge originally met at the Crown and Thistle Hotel, Northiam but now meets at the Masonic Hall in Rye. At the Annual General Meeting of the Provincial Grand Lodge of Sussex held at Worthing on 25 June 1936, in the presence of over 500 freemasons, Right Worshipful R.L. Thornton was presented with his portrait in oils to commemorate his fifty years in Freemasonry. The portrait was hung in the Sussex Masonic Centre at Brighton. On 22 December 1883, whilst still at Eton College, Robert (aged 18) was commissioned as a Lieutenant into the 3rd Battalion Royal Sussex Regiment (Sussex Militia). He was promoted to Captain on 11 August 1889. In 1900, the 3rd Battalion were sent to South Africa to participate in the Anglo-Boer war, although Robert did not accompany them. On 13 June 1900, now Honorary Major, he resigned his commission on the grounds of ill-health, with permission to retain his rank and wear the uniform. Following the outbreak of the First World War, he was promoted to the rank of Major in the 3rd Battalion on 23 January 1915, aged 49, but did not see active service. Robert Thornton held many civic positions within Sussex. He was first elected to East Sussex County Council in 1895, and became the vice-chairman in 1910, becoming chairman from 1913 to 1916. He continued to serve as an alderman on the council until his death in 1947. On 3 March 1900, he followed in his father’s footsteps when he was invested as the High Sheriff of Sussex by HM Queen Victoria at Windsor Castle, and was appointed as a Deputy Lieutenant for the county on 3 July 1914. During the First World War, he was chairman of the Brighton Employment Committee and Chairman of the East Sussex County Appeal Tribunal, positions which earned him appointment in the January 1920 Civilian War Honours to the rank of Commander of the Order of the British Empire (C.B.E.). 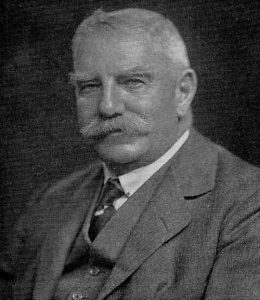 He was chairman of the East Sussex Joint Standing Committee from 1914 to 1947, and served on numerous county council committees. In addition to his local government work he was Deputy Chairman of the East Sussex Quarter Sessions and Chairman of the Chichester Diocesan Board of Finance and a member of the House of Laymen. He held a huge number of other positions including Chairman of the Uckfield Water Company, President of the Royal Sussex County Hospital and President of the Sussex County Cricket Club. In the church, he and his wife were churchwardens at Framfield parish church, where he was also choirmaster, and he was vice-chairman of the Diocesan Training College. Robert Thornton died at High Cross on 19 March 1947, aged 81. He was buried at Framfield Parish Church on 21 March; in accordance with his wishes the last rites were carried out “with the utmost simplicity”. The service was conducted by the Bishop of Lewes, the Rt. Revd. Geoffrey Hodgson Warde, who was assisted by the Rt. Revd. Charles John Godfrey Saunders, formerly Bishop of Lucknow, and now the rector of Barcombe church. On Saturday, 29 March 1947, a Masonic memorial service was held at All Saints’ Church in Hove. His estate was valued for probate at over £470,000. Robert’s elder son, Robert West Thornton, was commissioned as a Lieutenant into the Royal Fusiliers in September 1914 and was killed at the Battle of Bellewaarde, near Ypres on 16 June 1915, aged 19. The younger son, Gerald Edward Thornton, was commissioned as a Lieutenant into the Royal Sussex Regiment in September 1917, but survived the war. He was initiated into Loxfield Lodge on 1 November 1916. In the Second World War, Gerald again served with the Royal Sussex Regiment, reaching the rank of Lieutenant-Colonel. He was awarded the O.B.E. in the 1947 New Year’s Honours list. He subsequently emigrated to Ceylon (now Sri Lanka) where he is believed to have died in 1962. Charlotte died at high Cross on 14 May 1961, aged 95. High Cross, situated at N50.94696, E0.12090, is about 1½ miles south of Framfield. It was described in 1901 as “a park of 150 acres, (which) was artistically laid out and contained a sheet of ornamental water covering 5.5 acres”; part of the building dated from the 17th century. Formerly the home of Sir Thomas Dyer, 9th Baronet, it was acquired by Robert’s father in the 1870s. 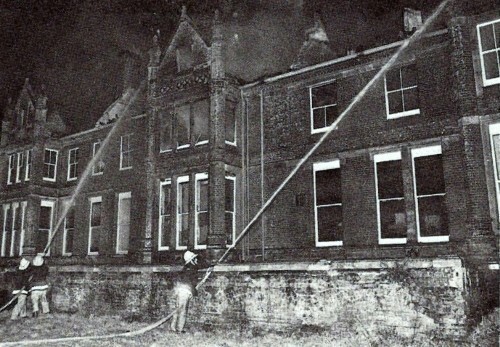 In the early hours of 25 April 1983, flames were seen coming from the roof of the house. Before the fire could be extinguished it spread to the upper floors leading to a structural collapse. Firefighters from Uckfield, Heathfield and Lewes attended the blaze and had to pump water a quarter of a mile across fields from a lake as the nearest fire hydrant was unable to supply the six firefighting jets being used to fight the fire. The derelict property was acquired by the notorious slum landlord and property dealer, Nicholas van Hoogstraten, who, in the late 1980s, started constructing a mausoleum known as “Hamilton Palace” on the site. With little on the project being constructed in recent years and substantial local opposition, the project is currently on hold and the building stands uncompleted.